"It's very easy to organize a game club," says Jacki Williams, director of marketing at Hasbro, and she's right. "You just need to have people to get together with and provide a game you think will appeal to them. That can vary quite a bit. If a group wants to relax, a game of Scrabble may be appropriate. If you want to cut loose, games like Ultimate Outburst, Pictionary, and Taboo -- with lots of shouting out -- are perfect." Scrabble relaxing? Perhaps she hasn't played with really serious Scrabble players. But her point is absolutely correct: it doesn't have to take a ton of effort to put together a successful game club. "Provide a casual atmosphere and some snacks, then let it evolve," Williams added. "Maybe rotate from house to house and everyone brings a snack or a different dish for dinner." The key is finding people who want to play games on a regular basis. And that's not as hard as it might seem. "I just moved into a development and none of us know each other that well," Williams said. "I've started introducing games as a way of getting to know people instead of (resorting to) stale, surface conversation." Williams said playing board games provide a better way to get to know her friends than do other entertainment options, such as going to the movies or renting a video. "Different personalities come out when the competitive juices start going," she said. "Some of the things you learn, even about yourself... it's kind of interesting." According to a Hasbro press release, a 1999 article in Psychology Today asserted that you can learn more about someone by playing a game than going on 10 dates. And you can learn more about yourself by playing a game than you can from several therapy sessions. Williams pointed out that forming a game club gives people a reason to get together with no pressure. "Oprah made book clubs popular across the nation," she said. "But one thing game clubs do is provide a reason to get together without having the pressures of finishing a book by Wednesday, or the fear that you won't have anything intelligent to say. With game clubs, you can just show up and have a good time." Here are some of the basics of forming a game club. More tips on how to form a game club are also available at this site. Who to invite? You have many options: friends you don't see often enough, the regular weekend crew, members of your book or wine club, co-workers, college pals, church-goers, neighbors. If your invitation list is large, choose games where the players can be split into teams. Games like Time's Up, Catchphrase, and Apples to Apples have worked well for me. More suggestions are available from our lists of the Best Party Games and the Best Games for 7 or More Players. Encourage everyone to bring their own games. New games can keep things fresh and exciting. A casual atmosphere can help assure a high attendance rate. 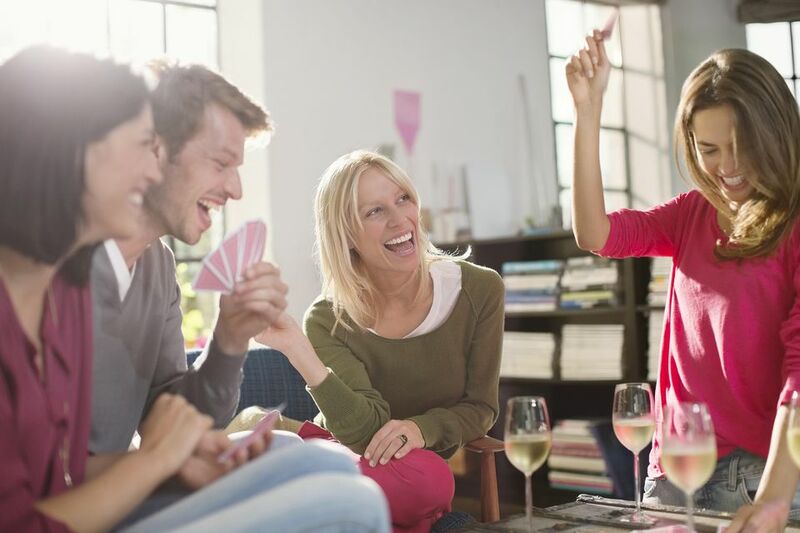 Provide some beverages and munchies to keep your guests fueled up and ready to play. But be careful not to serve messy foods, and to provide places away from the game table which guests can use to set down their drinks. Make sure your game table is big enough for the game, all the players, and enough space to keep your chips, money, cards, or other game parts. Provide comfortable chairs. If you're introducing the group to a new game, be sure someone at the table is very familiar with the rules ahead of time and can explain them. Few things can kill a good game as quickly as "Uhh... hang on a minute. I know this is covered in the rules somewhere..." or "I just remembered something really important..."
After all, having fun is what it's all about, right? Enjoy!